Sept. 30, 2014 (Sandusky, OH) – Guests visiting Cedar Point for HalloWeekends already know about the park’s scream-inducing haunted houses and outdoor fright zones. But this year, guests are screaming just a little louder thanks to the new Midnight Syndicate LIVE! 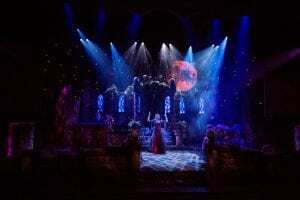 Legacy of Shadows show in the Ghoul Time Theatre. Ohio’s own Edward Douglas and Gavin Goszka, of Midnight Syndicate, have been delighting fans worldwide with their Halloween music albums for almost two decades. Performing in front of a live audience for the first time ever, they have created a whole new legion of fans thanks to their multimedia horror concert at HalloWeekends. Known for producing “gothic horror fantasy soundtracks for the imagination,” these Halloween music maestros blend instrumental music, sound effects, eerie videos and on-stage adventures, taking audiences on a spell-binding journey that mesmerizes and features an ending that is both unexpected and terrifying. 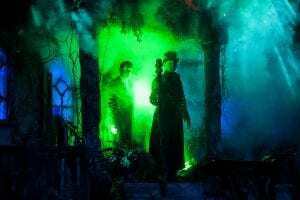 Cedar Point was actually one of the first theme parks to begin using Midnight Syndicate music for atmosphere, both in the park and in its haunted houses, when the band formed back in 1998. 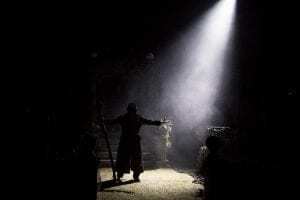 Guests with no fear of the dark can experience this outstanding show at Cedar Point’s Ghoul Time Theatre on Friday nights (7:30, 9 and 10:30 p.m.), Saturdays (6, 7:30, 9 and 10:30 p.m.) and Sundays (2, 4 and 6 p.m.) now through Saturday, Nov. 1. For more information on Cedar Point and HalloWeekends, log on to cedarpoint.com. FOR ADDITIONAL PHOTOS, INFORMATION, OR TO SCHEDULE AN INTERVIEW, PLEASE EMAIL BRYAN EDWARDS. Wizards of the Coast, div. Hasbro Properties, Inc.